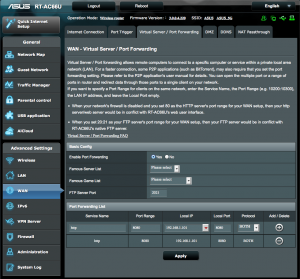 This guide will walk you through the steps of port forwarding on the Asus router RC-AC66U (Firmware 3.0.0.4.220). Step 1: Open up your favorite browser and go to the router’s default gateway address. Step 2: Login to the router (common default values listed below). 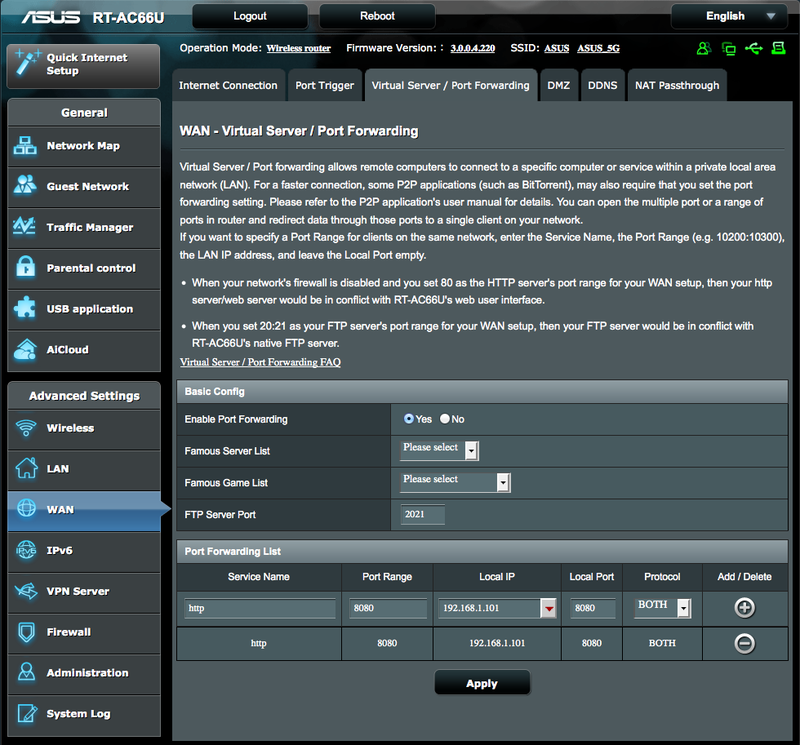 Step 3: Click on “WAN” on the left hand side, then “Virtual Servers/Port Forwarding” at the top. Here you will be able to forward any port you need on your device. Step 4: Choose a name for the service (small description e.g. web, camera, Xbox, etc.). Where you see “Port Range” put in the port number you will be using. Protocol should be set to “Both” unless you know the protocol then select the correct protocol. For the “Local IP”, enter your internal IP address for the devices that you would like to port forward. Click the “Add” button then click “Apply”. Once you save the settings you should now be able to test your port at www.portchecktool.com. Please keep in mind your ISP (Internet Service Provider) could be blocking certain ports such as port 80, 25 and 21. You can call and ask if they are blocking these ports inbound. If you are still not able to see the ports check the firewall and anti-virus software on your computer. You have a webcam that has the IP address 192.168.1.101 and it runs on port 80. You want to be able to access this camera from outside your network on port 8080. You would enter the below values into the port forwarding page. Then to view the camera you would use your No-IP host of “example.ddns.net” like this: http://example.ddns.net:8080 to reach the webcam.